By now, Dads, you know that I love giving you “insider trade secrets” so that you are more equipped to decode your daughters. Today I’m adding another tool to your fathering tool belt to support that goal. I don’t know what it is about the word “should” that makes it a power word on my planet of Venus, but I’m telling you that I literally hear this word all the time! Here are some examples of things I’ve heard from women just this week (for real! ):I should love this time of year, but I just don’t. I probably should have dealt better with that situation and not let her get to me. I don’t know what’s wrong with me…I should be grateful for all the good things happening in my life, but I’m just so depressed. All of my friends are doing things right—like saving money, moving towards marriage, buying a house, getting pregnant, and on it goes. When I see all that’s going right for them, it makes me think of what I’m not doing and all the things I should have been doing long before now. I’m way behind where I want to be and won’t ever catch up. I know I should care about the people in my life, but I hate all the drama and I’m sick of caring this much because it takes me down. I guess you get stuck on a path in life of where you think you should be. When I get around my friends, I constantly compare myself to them and think that I should be more like them. But the truth is that I feel like a fraud. I don’t fit in because they’re all prettier, richer, and more accomplished than me. I should be getting up earlier and spending more time with God, but I never get that right either. I am so stressed right now and feel so much pressure constantly to make everyone happy—-at work, at home, with my friends, etc, and it seems that someone is always disappointed in me or mad at me. I know I should be doing more, but I can barely keep my head above water as it Is and hardly have any time for myself. 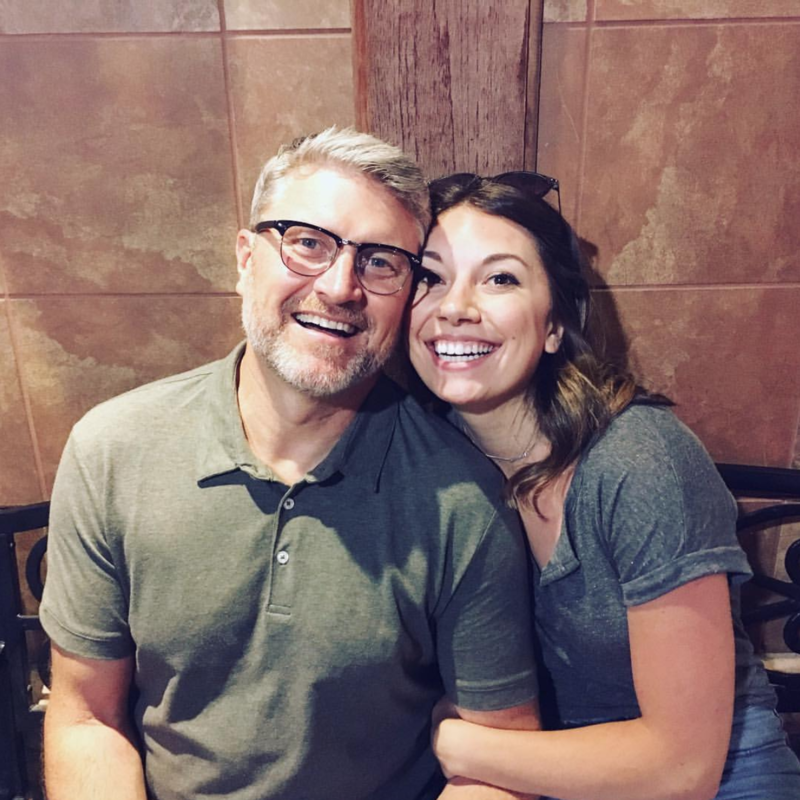 Dads, let me ask you a question: Does your heart break like mine as you hear these collective voices of self-condemnation that are doused with a thick dose of unrealistic expectations, smothered by the constant pressure to measure up? For me, as I worked my way down this list, I noticed a mounting heaviness, even some sadness, as each self-deprecating sentence unfolded. Every one of these women feels like she’s not doing enough or being enough while seeing herself as falling short when she compares herself to those around her. It all amounts to: SHE’s not enough. In fact, it’s this comparison game that is destroying her self confidence, her happiness, her inner peace, her joy, her optimism, her perspective, her energy…and on it goes. I’m guessing you’ve heard similar messages from your daughters. As you can imagine, initially there’s an awkward laugh…and that’s part of my strategy for lightening the atmosphere in the room, even if just for a minute. When a woman starts down the dreaded “should” path, my desire is to guide her to see what it’s doing to her. And I’ve discovered that most women don’t even know they’ve said these words until I’ve pointed them out! Now here’s the best part: I notice that a positive shift begins to happen when a woman clearly sees the amount of undue pressure she’s putting on herself. There’s an even greater shift when she admits that she’s caught in a destructive cycle where she can never succeed, never relax, never enjoy life, and never get out from under the tyranny of her own self-degrading messages. Then I love seeing her breathe a sigh of relief as the truth starts setting her free. Now that you’re more informed about the mental struggles that tend to barrage us as Venusians, I want to point out that even though you as her dad don’t intend to add more pressure when addressing things that need changing—whether it’s that she didn’t respond right or do what she was supposed to do or didn’t answer right away you when you asked her a question…or…fill in the blank—the reality is that your daughter is often weighed down by your “should” messages. What she hears is that she’s a failure and a disappointment to you. And since she already believes that about herself much of the time anyway, it’s oftentimes more than she can bear. It’s all about timing. Wait until you…and she…are in a good emotional space where you are able to convey your message well, which increases the chances that it will be received positively by her. Otherwise, it’s a recipe for disaster. It’s all about noticing. Before speaking, take the time to listen and find out if there’s something deeper going on that may be causing her to be sour or unpleasant. If she’s already had a bad day, decide that now isn’t the time to “should” on her. Come back and talk to her later if you want to reach her heart. And you’ll see that it’s always a win when you speak to her heart – the deeper part – before speaking to her behavior or attitude. It’s all about validating. Make it your goal to hear her side of the story while seeking to understand why things went down the way they did. Wait to give feedback until she’s open, and with this slight course correction in WHEN you respond, HOW you respond, and WHAT you say when you respond, you will increase the likelihood of a successful interaction. 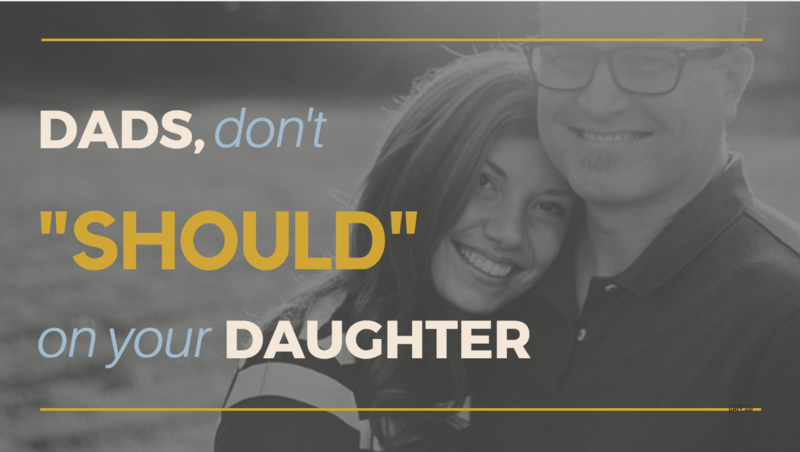 If you’re a dad who doesn’t want to “should” on your daughter anymore, decide today to delete the word “should” from your vocabulary, and instead, find other words to make statements, ask questions, or nudge her to action. “It seems like you have a lot weighing on you right now. I know when I’m stressed and feeling pressured to do everything right, I get overwhelmed too…maybe in different ways than you, but stress still impacts me somewhat the same. Why not try it out and let me know how it goes. Better said, I really think you should try this and then let me know how it works!